The commercial insurance industry is one of the largest sectors of the U.S. economy. In 2013 it directly employed about 2.3 million people and collected $1.1 trillion in premiums, approximately 7.7 percent of the national gross domestic product. Insurance companies earn revenue from premiums and from the returns on the investments they maintain as a capital reserve. Their expenses include the cost of claims adjustments, the cost of marketing the policies, the cost of paying off claims and other overhead. When revenue exceeds these expenses, the company makes a profit. State insurance commissions regulate the industry to ensure that companies have the financial resources to pay off claims and that the policies are fairly written. Because a portion of premiums is used to pay the non-claim expenses of operating an insurance company, customers do not expect to regularly get back more in claims than they pay in premiums. If they did, the company could not remain in business. The Federal Crop Insurance Program, however, operates nothing like private commercial insurance. Instead, the government pays a large share of the farmers’ premiums and covers the expenses incurred by the companies to sell and service the policies. Moreover, what crop insurance considers a “loss” that triggers a payout bears little resemblance to the actual financial losses a farm family has experienced. It is, in fact, a misnomer to apply the word “insurance” to the heavily subsidized program. The subsidies provided to the farmers and companies are so large and "losses" so frequntthat many growers can expect to receive much more in claims than they pay in premiums year after year. Data on premiums versus claims show that the gains can be both frequent and large. The program operates more like a lottery than an insurance plan. For farmers, buying a subsidized federal crop insurance policy turns out to be a very good bet. estimating net returns (the amount of claim payouts minus the premium paid). When farmers get more back in payouts than they paid in premiums, both measures are positive. Conversely, if a farmer pays more in premium than he or she gets back in payouts, both the rate of return and net return are negative. The rate of return when there has been no payout is negative 100 percent, and the net return equals the negative value of the premium paid. Similarly, a 100 percent rate of return means the farmer got a payout that was twice the size of the premium paid. The largest loss a farmer can experience from investing in a crop insurance policy comes when he or she gets no payout at all. 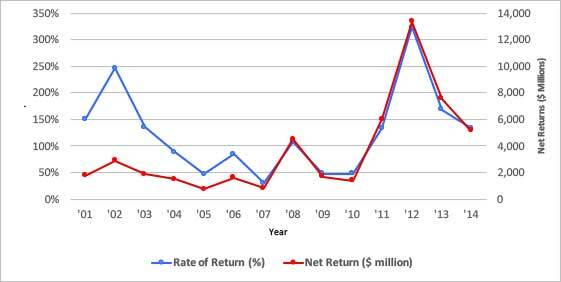 Figure 1 shows both rates of return and net returns for all insured farmers from 2001 to 2014. During this period, farmers in aggregate achieved a positive rate of return on their premium dollars every single year, which means that claims payouts exceeded premiums paid for 15 years in a row. Source: Calculated from USDA-RMA Summary of Business Reports. Growers’ aggregate rate of return from buying a crop insurance policies ranged from a “low” of 29 percent in 2007 to a high of 324 percent in 2012. That means that in 2007 farmers, in aggregate, got back what they paid in premiums plus 29 percent of that amount. The 324 percent rate of return for 2012 means that farmers got back more than four times what they paid in premiums. The sharp growth in net returns since 2011 reflects both higher crop values as well as higher claims rates. From 2000 to 2014, the average rate of return from crop insurance was 120 percent per year. In contrast, even risky private-sector investments yield expected returns of around 15 to 25 percent. And as we all know, the return on the lowest-risk investments has been practically zero since 2009. The data clearly demonstrate that in aggregate, crop insurance has been quite a good bet for U.S. farmers. But not every farmer in every state has enjoyed such favorable returns. Most do not receive a claim check every year. An individual farmer’s rate of return will be much more variable than shown in Figure 1, which also masks the large variability in the average rate of return between different crops and regions. Figure 2 shows the annual rate of return on crop insurance for three state-crop combinations over the 26 years from 1989 to 2014. At one extreme, Arkansas corn growers in aggregate enjoyed a 900 percent rate of return on crop insurance in 1998. And in 2011 Texas cotton farmers achieved almost a 700 percent return. In contrast, Illinois soybean farmers in aggregate experienced a negative return on crop insurance in 18 out of the 26 years shown. Their maximum return was just under 200 percent in 2012. The average annual rate of return on crop insurance over this period was minus 7 percent for Illinois soybean farmers, 247 percent for Arkansas corn farmers and 203 percent for Texas cotton farmers. In three states – Arkansas, Florida and Mississippi – claims payouts exceeded premiums paid every year. In contrast, in four Corn Belt states – Minnesota, Iowa, Illinois and Indiana – claims payouts exceeded premiums in fewer than half the years. In the federal crop insurance program, a farmer is considered to have suffered a loss whenever his or her per-acre revenue drops the level expected when the policy is signed. For example, if a farmer’s policy insures corn at $5.00 per bushel and the average corn yield is 200 bushels per acre, the expected revenue would be $1,000 per acre. Under crop insurance, the farmer is considered to have suffered a loss if his or her actual revenue turned out to be anything less than $1,000 per acre. If the farmer bought a policy with a coverage level at 80 percent coverage, it triggers an insurance payout as soon as farm revenue on that crop drops below $800 per acre -- even if $800 is enough to cover expenses and keep the farm profitable and financially secure. In other words, the crop insurance definition of loss bears little relationship to the actual financial losses a farm family may suffer. In any other business, a loss occurs when revenue falls below what it cost to produce the goods it sells. In the case of a farm, that’s the crops and livestock. But federal crop insurance policies can produce payouts even when a farm is profitable. For example, almost all farmers buy crop insurance policies that cover a single crop. A farm growing more than one crop, as most farms do, can have a profitable year even when income from one crop is less than production costs if the income from other crop(s) offsets the shortfall. But crop insurance will pay out on the one unprofitable crop even though the overall farming operation was profitable. This distorted concept of loss results in more frequent payouts and increases the odds that the farmer will make a profit by buying a crop insurance policy. “Annual report on the insurance industry.” Federal Insurance Office of the US Treasury, June 2013.